Cait’s Mexican Inspired Breakfast Fiesta! I hope you’ve all been having a wonderful week. Now that the weather is actually getting nicer I’m trying to get outside as much as possible to soak in the sunshine and vitamin D. I’m hoping to get a little table so I can start working out in my backyard and barring that, there are some sweet picnic tables down by the river that could turn into my portable office. I can even use my cell phone to get wifi on my comp. Oh technology, is there anything you can’t do? This herb is one of those foods you either love or hate. Most of my family members think it tastes like soap and I’ve heard there’s a specific gene that affects how it tastes to certain people. I haven’t really looked into it though, so make of it what you will. Regardless, cilantro is an amazing herb to incorporate into your daily diet because it is chock full of amazing phytonutrients, contains a compound called dodecenal that has potent antibiotic activity against salmonella, and animal studies are showing that it has a promising effect on lowering blood sugar. Onions of all varieties contain sulfur and naturally occurring sulfur-phytonutrients are amazing for our bodies because they help with detoxification and liver support. Onions are also a sweet source of chromium, a trace mineral that your body needs to produce glucose tolerance factor. This mineral helps your cells respond to insulin and is, therefore, critical for blood sugar management. Cayenne is one of my favourite spices to use in the kitchen as it can add a nice level of heat without effecting the overall flavour of your dish. It can come in many different heat levels, so you’ll want to experiment with the amount of heat with which you’re comfortable. This pepper contains an active component called capsaicin that has been shown to have potent anti-inflammatory activity in the body thanks to its inhibition of substance P, a neurotransmitter associated with inflammation. What a potently healthful way to start our mornings! And it’s pretty easy to make as well. Check out the directions below. 1.5 tsp. paprika—try smoked for extra awesomeness! Cut regular and sweet potato into bite-sized pieces. Once pan is heated add oil, coat bottom of pan, and then add potatoes. Stir potatoes until mixed with coconut oil. Cover frying pan. I like to use a round baking sheet. Let potatoes steam in pan for approximately 3 minutes. During this time you can finely chop you green onion and cilantro. Or you can save a wicked amount of time and invest in these herb cutting scissors. It is my favourite kitchen tool. Remove cover (using an oven mitt or dish towel) and stir about. Add paprika, chili, cayenne, and sea salt, stirring until all potatoes are coated. Recover for another 2 minutes. You can cut your avocado into bite-sized pieces at this time. Check out this video for the easiest way! Use the second method to get perfect little cubes. Add avocado to a medium-sized serving dish. Remove lid from potatoes and try squishing one. If it is nice and tender keep the lid off and allow to brown for another 3 minutes, stirring occasionally. 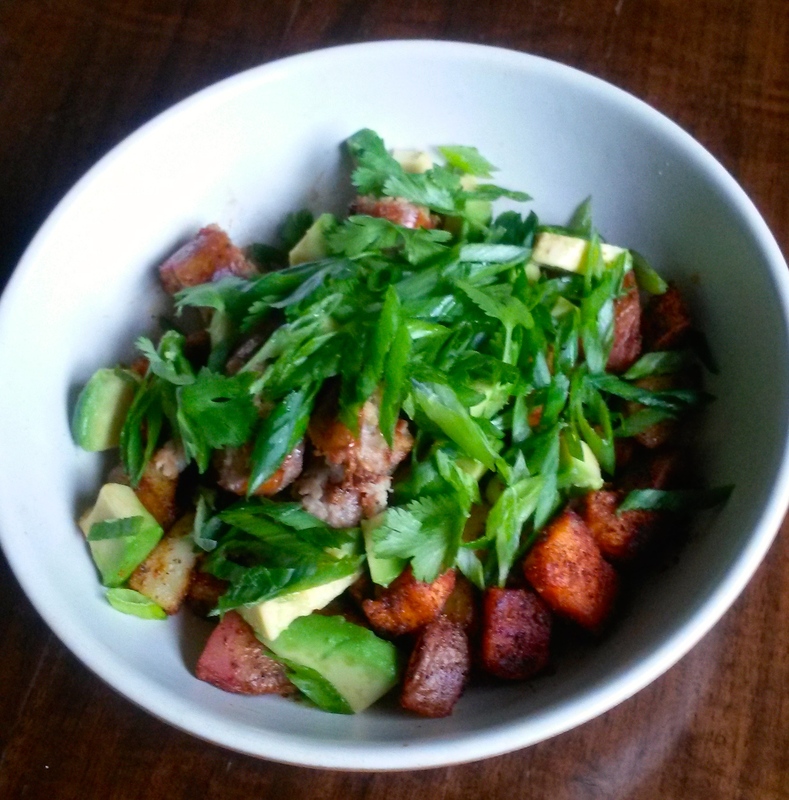 Add potatoes to the bowl with avocado and top with fresh herbs. Serve with your favourite style of egg and enjoy! This recipe makes 2 servings but can easily be scaled up. Well that’s our recipe for the week friends. I hope you enjoy it as much as I do. Have a wonderfully week!